I’ve always said that if one is willing to work with Nature that she’s more than happy to do most of your “drudge work” for you. Today’s feature is a short case in point of just that. 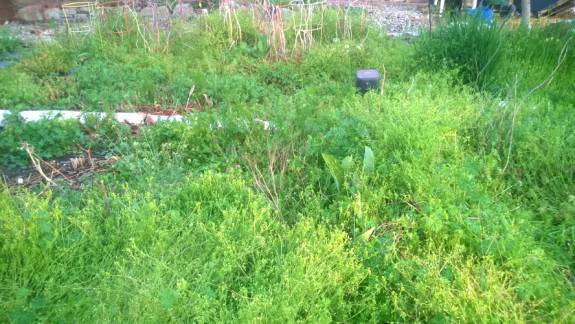 At first glance my garden looks like an average spring weed patch, and granted there are plenty of non useful plants that need to be removed from this garden. However, there are some real treasures here courtesy of the gardener’s willingness to let Nature take her course. Oh yeah, it’s a garden of weedin’! Let’s look a little closer though shall we? It’s a whole crop of Kale seed in the making! 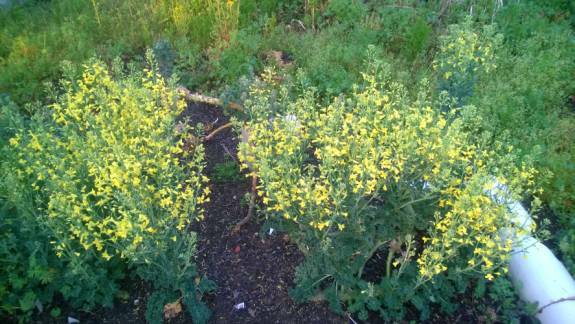 I’ve been eating off of this patch of Kale planted last May all winter long. 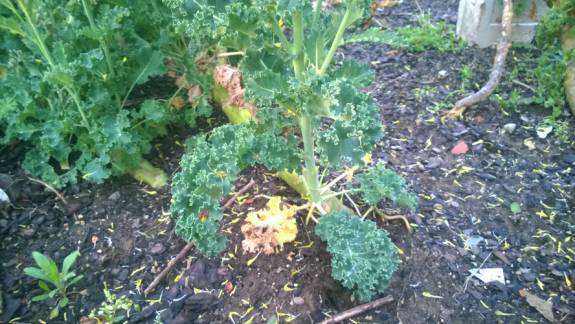 As a matter of fact as these seed heads continue to develop I’m still feasting on kale sandwiches by picking these tasty lower leaves. As you can see there’s loads of them and they’re great wilted in a skillet with some olive oil and spices. I put ‘em on toast for a wonderful sandwich. 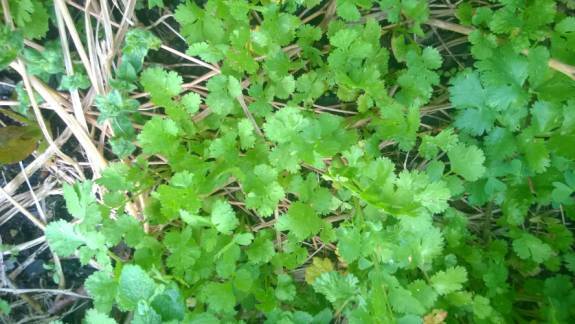 One of the real treasures in this spring weed patch is a volunteer crop of Cilantro. Look at that! 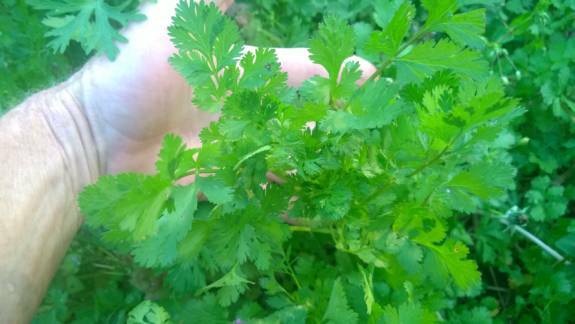 It’s only April and because I simply took the time to let last summer’s Cilantro make the Coriander seed and self sow rather than pulling it up when it bolted I have an early harvest of delicious cilantro to eat. So much so that I can make whole platefuls of cilantro salad! What’s more are all the little seedlings under the large plants that can be left in place or transplanted into rows after the weeds are pulled and the soil fluffed up with some compost. That’s just a few of them. There are literally hundreds of them that have come to me free of charge courtesy of Mother. Happy Earthday to you Momma! There are presents she gives us everywhere if we simply redirect our thinking in her direction rather than being the control freaks that humans often are. Here’s another lovely that many folks don’t know that is a great remedy for cough and cold. It’s commonly called Great mullein (Verbascum Thapsus) but has been called by perhaps as many as 50 different common names over the years. An excerpt from the article reads as follows: “Dioscorides first recommended the plant 2000 years ago, against pulmonary diseases, and this has remained one of its primary uses, especially against cough. Leaf decoctions or herbal teas were used for expectoration, consumption, dry cough, bronchitis, sore throat and hemorrhoids. Leaves were also smoked against pulmonary ailments, a tradition that in America was rapidly transmitted to Native American peoples. The Zuni people, however, use the plant in poultices of powdered root applied to sores, rashes and skin infections. An infusion of the root is also used to treat athlete's foot. 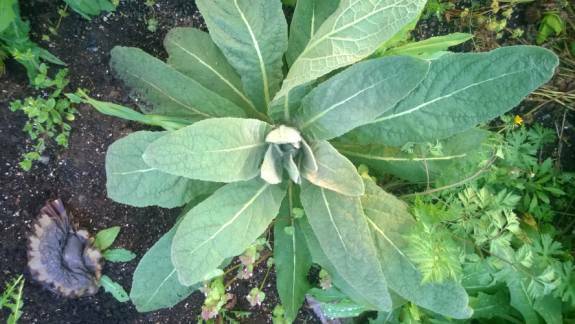 The combination of expectorant saponins and emollient mucilage makes the plant particularly effective for cough. All preparations meant to be drunk have to be finely filtered to eliminate the irritating hairs. Pretty amazing stuff for a “weed” huh? This kind of stuff is everywhere if we simply take the time to look. The nature of nature is individuality and every body is it’s own unique individual. The pattern of individual entities each with it’s own unique perspective on existence coming together to form larger entities each with their own unique perspective on existence is repeated from the tiniest quantum building blocks to the greatest macrocosms we can observe. As the lacto bacilli each with their own unique perspective come together to make our gastro intestinal system function cooperating harmoniously with all of the other organisms and cellular structures to form the body that our consciousness inhabits, so we come together with all of the other organisms and structures to form the body in which her consciousness dwells. If we simply take the leap to think outside of the “box store” of human arrogance we can come to realize that we never left Eden, we simply chose to think we did. May her bounty and abundance bless and feed you!